Kogi is the truck that launched a thousand other trucks, and for that, I am incredibly grateful. The Los Angeles dining scene, not to mention my Twitter feed, would be a dramatically quieter place without all of these quirky roach coaches driving around. I am certain that there will come a time when we’ve grown tired of eating on our feet and sacrificing our clothes in the process, but until then, keep on truckin’! My first encounter with Kogi came after a dangerously mediocre meal at Gjelina last October. A disappointing dinner begs to be rectified, but Gjelina’s dreadfulness killed my spirit, and thus, no Kogi was sampled that evening. 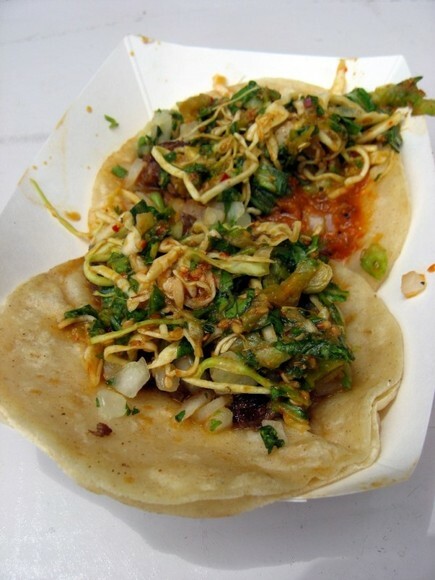 Months went by before Kogi and I were fatefully reunited at The Brig‘s parking lot on Abbot Kinney. This time around, we were joined by the children of the Kogi mobile meals movement—Cool Haus, Dosa Truck, Get Shaved, and Fishlips. 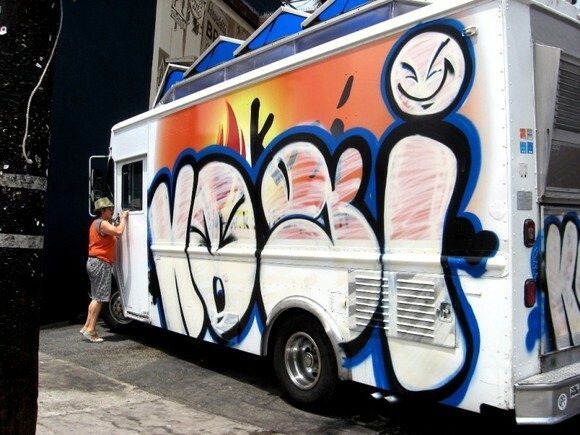 When Kogi first hit the streets, hour-long lines were the norm. Now that things have cooled down a bit and competition has emerged from all corners of the city, the wait is much more manageable. 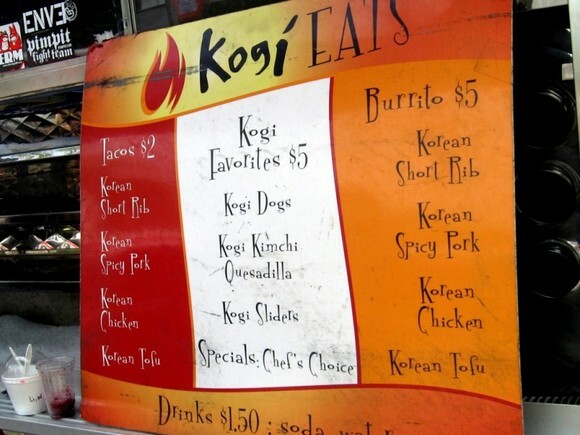 With a mere twenty minute-long line, Kogi was still the clear favorite among all of the trucks gathered at The Brig this afternoon. The Astronomer, Rosalind (The Astronomer’s lil’ sister), and I shared a short rib taco and a spicy pork taco. Both items were garnished with romaine lettuce and cabbage tossed in a Korean chili-soy vinaigrette and drizzled with a sesame and chili sauce. 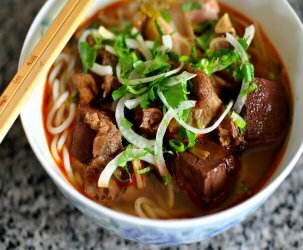 A relish of cilantro, green onion, and lime added the finishing touches. Aesthetically speaking, the messy tacos looked identical save for the slightly redder hue on the spicy pork number. Taste-wise, the two varieties were eerily alike due to the overpowering chili-soy vinaigrette and sesame oil atop each taco. It was a shame that the fillings tasted so similar, but the biggest letdown was the lack of cohesion between the fixins and the corn tortilla. Rather than mingling harmoniously in my mouth, the assertive masa dominated the pleasant Korean flavors. 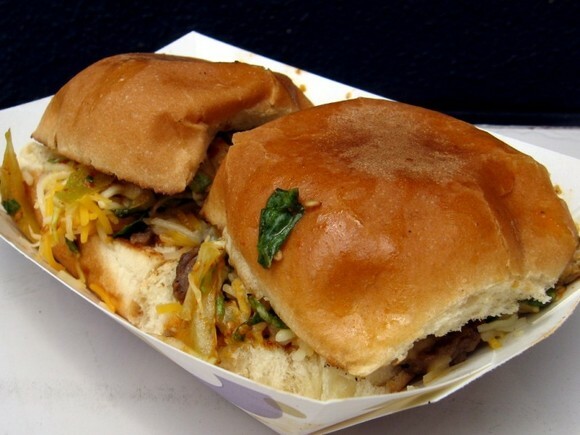 The Kogi sliders were more successful due to the employment of white bread. Unlike the distinctly flavored corn tortillas paired with the tacos, the buns had a wonderful way of taking on flavors and disintegrating on the tongue. Since the sliders were filled with the exact same ingredients as the tacos, they unsurprisingly tasted similarly. To be certain that Kogi’s range of flavors wasn’t limited to one note, I also stole a bite of my friend Laurie’s burrito. Sure enough, it tasted just like the tacos and sliders. 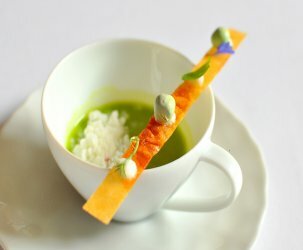 I guess that’s bound to happen when the same garnishes are applied to every dish. Follow Kogi on Twitter @kogiBBQ. yeah! I thought it was just me who did not think the meat and the tortilla went very well together. I’m glad that there’s someone else of the same opinion. we weren’t impressed either–the meats all taste the same and everything is ok at best. It’s definitely over hyped and not worth even the 20 min wait. I’m of the belief that Kogi tastes best in the Alibi Room, where one is not only afforded a seat (during good hours), he/she also does not have to wait for long periods of time. 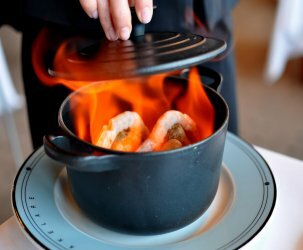 I’ve heard the same complaint from other people – that everything tastes the same. I don’t think I want to risk skirt contamination for the kogi. I’d rather go back to Cool Haus for some of that messy good stuff first.